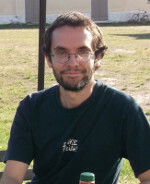 Matthieu Bruneaux started in February as a post-doctoral researcher in Tarmo Ketola's group at the University of Jyväskylä. He will study the genetics of adaptation to fluctuating environments, using bacterial populations which were exposed to experimental evolution in the lab. His work will focus on mapping the genetic changes associated with adaptation to fluctuating temperatures vs. adaptation to constant environments. This is particularly relevant in the current context of global warming and climate change, since both mean temperatures but also temperature fluctuations are increasing and are expected to have strong effects on species distributions. Before starting his work at the University of Jyväskylä, Matthieu has been studying temperature adaptation in marine invertebrates and in fishes.